We sell fireplace inserts to residents across Fairfield County, Westchester County, and Litchfield County, including communities like Weston, Westport, Easton, South Salem NY, Danbury, Stamford, Greenwich, and Port Chester NY. As heating costs continue to rise, you may be considering using your fireplace to zone heat your home and bring down your winter bills. 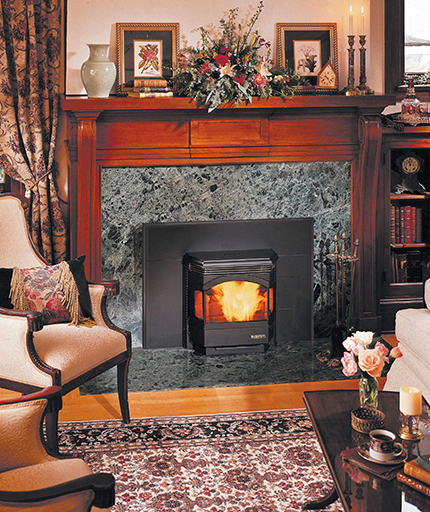 Unfortunately, a traditional fireplace loses most of the heat it produces up the chimney. By installing a pellet insert in your fireplace, you can transform the focal point of your room into an attractive alternate furnace. Pellet burning fireplace inserts are efficient, eco-friendly heating appliances that fit into your existing fireplace and dramatically improve the heat output. Next winter, you can relax in front of a blazing hearth knowing you are reducing your heating bill and your environmental impact at the same time with a pellet insert! Here at Yankee Doodle, Inc. Stove & Fireplace Center, we carry top of the line pellet fireplace inserts from brands that are known for their superior craftsmanship. We have pellet inserts for both factory built and traditional masonry fireplace with up to 80% efficiency. Available in a variety of sizes and styles, you are sure to find a model that will enhance your fireplace’s façade while also improving its efficiency. If you are looking for a convenient, cost effective, and eco-friendly heating appliance, a pellet insert is a smart choice. If you need assistance with choosing the perfect pellet stove, our experts will be happy to visit your home and discuss potential pellet fireplace insert products that will fit your needs. Pellets are made of recycled wood chips and other wood byproducts that would have ended up in a landfill. This raw material is transformed into an eco-friendly fuel through a compression process that shapes it into small, uniformly shaped pieces. The compression processes reduces the moisture in pellets so that they burn more efficiently than firewood. Along with producing more heat, they generate less ash and creosote which significantly reduces the maintenance required for a pellet burning fireplace insert. Another benefit of using pellets to fuel your fireplace insert is that they are easier to store than firewood and far less of a hassle. Pellets usually come in 40 pound bags that are affordably priced and easy to stack on top of each other. You can store enough fuel to keep you warm all winter in a 6 foot by 6 foot space. Unlike firewood, pellets do not need time to season. You can use them to fuel your fireplace as soon as you purchase them. How Does a Pellet Fireplace Insert Work? Pellet inserts are designed to operate similar to coal stoves; the pellets are poured into a storage bin inside the insert called the hopper. An electrically operated auger motor automatically feeds the pellets from the hopper into the firebox. This design makes a pellet insert far more convenient than a wood burning fireplace insert. You are able to determine how quickly or slowly the pellets are fed into the fire. The rate that you choose will determine how much heat your insert produces. The faster the pellets are released, the hotter the fire will burn. On some models, you can determine the rate pellets are dispensed simply by setting a thermostat. The storage capacity of the hopper, along with how hot you like your fire to burn, will determine how often you will have to refill the hopper. 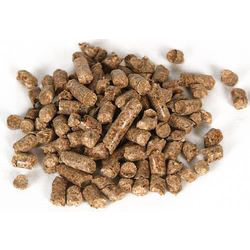 You may be able to use your pellet insert for up to 36 hours without needing to add more fuel. Instead of struggling to start a fire with matches and kindling, you can start your pellet insert with the press of a button. If you are native to Fairfield County in Southeast CT or live in Westchester Country NY, stop by our showroom in Wilton, CT to browse our selection of fireplace inserts. We have many models on display so that you can see for yourself how a fireplace insert can update the style and efficiency of your fireplace. Our friendly staff would be happy to explain the different technical specs between models so that you can find an insert that is the right size for your fireplace with the heat output you are looking for.